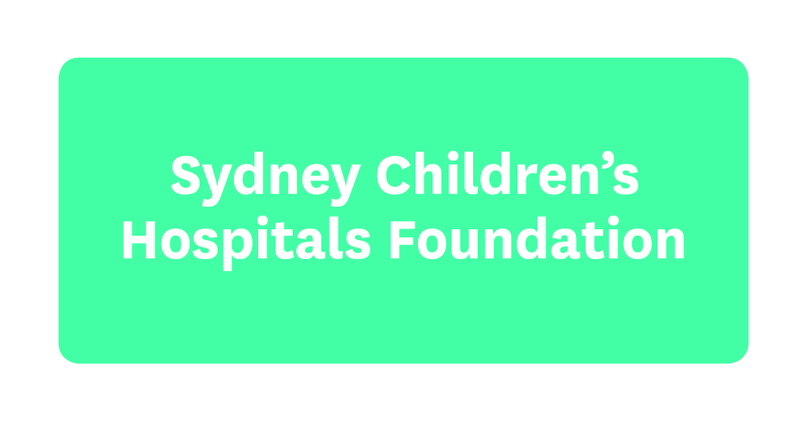 Thanks to the amazing support from people like you, Sydney Children’s Hospital Foundation can help fund vital clinical care and research for sick and injured children in NSW and beyond. Here are some key highlights/changes you have helped the Foundation achieve. 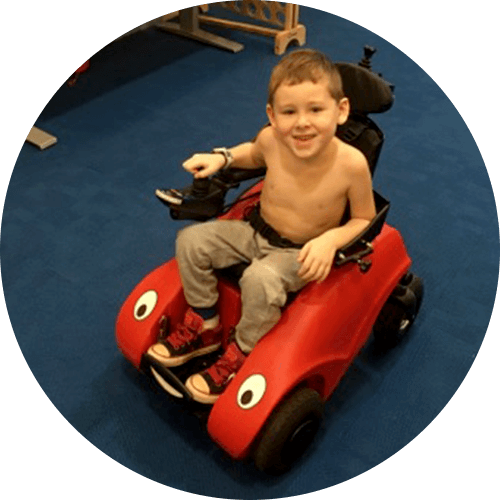 Little kids explore the world by moving around in it, but many kids at the Hospital cannot get around on their own and the traditional electric wheelchairs are too big for them. The Foundation recently had the pleasure of purchasing four Wizzy Bug scooters and a Firefly Scoot, thanks to donations from sunSCHine 2017, Fishing for Sick Kids and the Manildra Foundation, specifically designed to let little kids take charge. Summer is cricket season, so it was no surprise to us when two different cricket challenges stepped onto the pitch for the Hospital. Police and emergency services got us started at their annual Mega Bash. It was an incredibly hot day but that didn’t stop the teams putting it all out there to raise money for the Hospital. Taking up the cricketing mantel in February was the Charity Cricket Challenge, organised by Procare Group, who once again challenged their clients and partners from the workers compensation industry to a friendly game of cricket. Together, these two cricket events raised over $100,000 for urgent and unique needs within the Hospital. 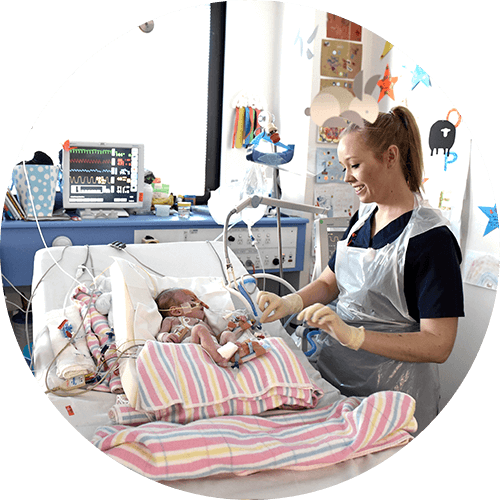 The Fellowship Program at Sydney Children’s Hospital, Randwick is crucial to the development and success of the medical care of our children. Fellows provide expert care for patients, whilst also increasing their skills in a specialised field; develop diagnosis methods for children; increase cure rates; reduce side effects of treatments and improve long-term outcomes. Each year the Foundation invests around $2million in Fellows, helping secure the future of paediatric healthcare for kids. We welcome the Fellows who’ve started in 2018 in areas such as cardiology, haematology, Intensive Care Unit and neurology. 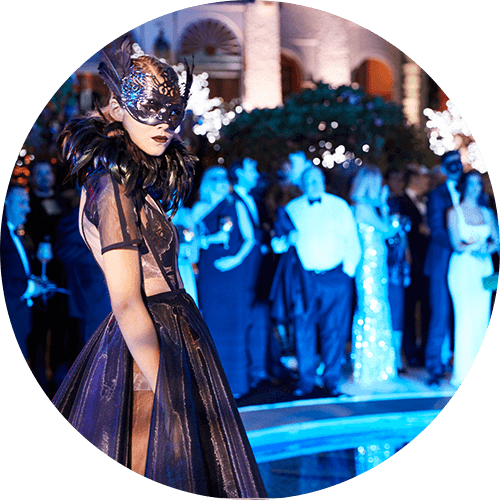 Declared by many who attended as the best Silver Party yet 400 people gathered in Elizabeth Bay to raise significant funds for research happening in The Bright Alliance. Guests were joined on the night by Dr Michelle Farrar, Paediatric Neurologist, who shared her groundbreaking research on spinal muscular atrophy (SMA), the most common cause of genetic death in children under 2. Dr Farrar is a principal investigator for a collaborative international study that has led to the first and only approved therapy specifically developed for SMA. Anyone who has spent time in a hospital knows there is a lot of down time. So the Foundation purchased 24 recliners that can be used by parents and patients. The recliners actually turn into beds, not as comfortable as home but they help parents get a bit of sleep when they stay overnight. You’ll find the new chairs in Intensive Care Unit, Short Stay Surgical Unit, Care by Parent Unit and the adolescent ward. With more than 100 children being cared for in the Hospital's Emergency Department every day, the department needed to urgently replace some of their trauma beds. These purpose-built beds make it easier to care for kids comfortably whilst they are being treated. Lahey Constructions, who have been fundraising for us for two years now, heard about the need for these beds and together with their team and contractors raised enough money to purchase three of the eighteen beds needed. Each year more than 1,000 children in a critical condition are looked after by the dedicated Intensive Care Unit (ICU) team. It is estimated that more than $300,000 worth of medical equipment surrounds each bed, including a pulse oximeter. These non-invasive monitors can tell how well a child’s blood is carrying oxygen to their fingers and toes. 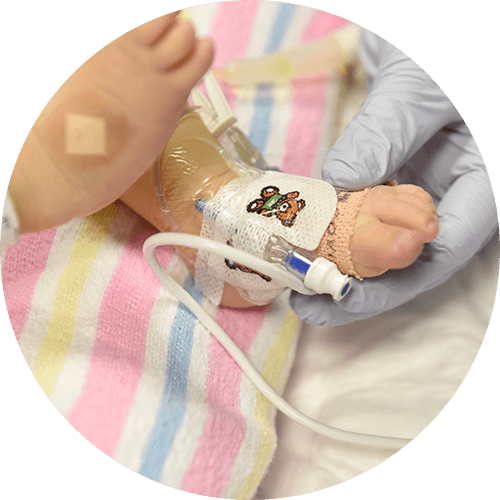 Often the changes noted by the pulse oximeters are the quickest to alert staff to a change in a child’s breathing. The Foundation recently funded six pulse oximeters for the ICU. Team Kids started the year off at the Sun Run and Cole Classic in February with 34 runners and 27 swimmers banding together to raise almost $10,000. Last year over 500 people took on a personal challenge as part of Team Kids to support a range of Hospital areas. This years’ team are already in training and hope to beat the efforts of 2017. 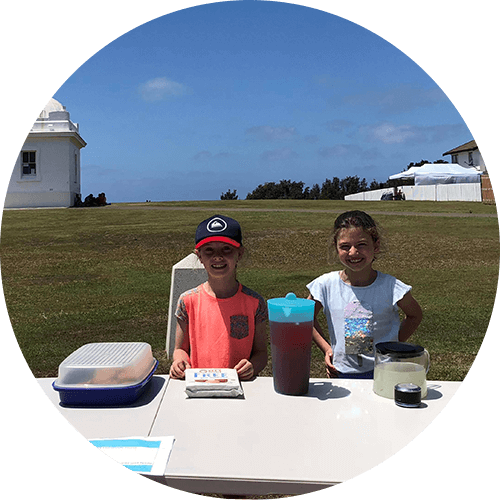 Two entrepreneurial little ladies, 9-year-old friends Tali and Zoe, set up a lemonade stand to raise funds for the kids. The ladies raised $81.50 and were inspired by Tali herself who at age 2 had a fundoplication and spent many times in and around Sydney Children’s Hospital, Randwick. Neurologists use electroencephalography or EEG to make important decisions about patient care, particularly in epilepsy. On occasion an ambulatory EEG recording device is loaned to patients for 24 hours to record information, over an extended period, telling doctors more about a specific medical event. Each year these devices need to be checked to be sure they are safe and accurate, which we were more than happy to provide funding for. It might not seem like the most glamorous way to support sick kids but when Horizon offered to gather its colleagues to help renovate the bathrooms on Level 0 near Sunny’s Café we leapt at the chance. A huge thank you to the teams who together pulled off one of the fastest bathroom renovations we’ve ever seen. To grow an innovative research idea often takes an initial injection of funding. Our Foundation Starter Grants are designed to help do just that, to provide Hospital researchers with funding to conduct pilot studies and create real results within a one-year time frame. In the first three months of this year we started funding a pilot study about how patients and carers make decisions in Spinal Muscular Atrophy treatment, a motor neuron disease in small children (a grant made possible by the Medich Foundation). 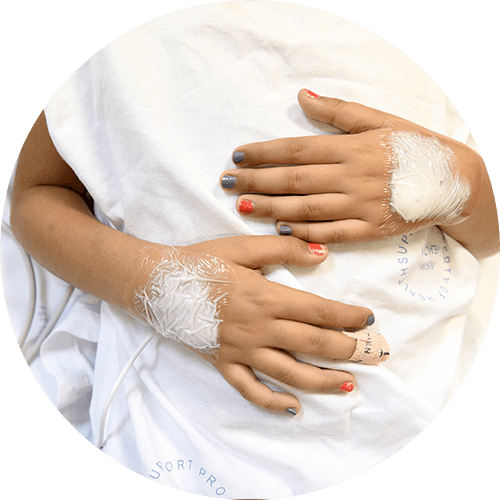 Kids with Cystic Fibrosis often have many Hospital stays and outpatient visits and during these times a child may need to go through medical procedures that can be painful and traumatic. Children are wonderfully resilient and often, at these times, their courage and strength are awe inspiring, but dealing with these procedures is never easy for them or their families. The Beads Program offers patients rewards for their medical procedures in the form of unique beads. The beads are strung together to tell the story of each child’s personal, medical journey. The program goes through a lot of beads each year and we were fortunate to receive a grant to help cover the cost of these beads, to ensure there are plenty in stock for when they are needed. 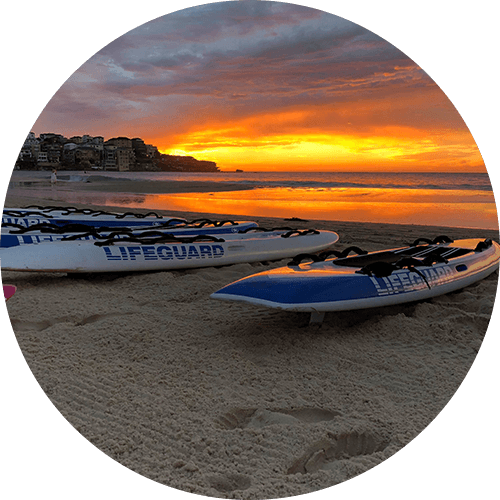 The Council Lifeguards of Waverley and the Sutherland Shire joined forces to do some rescue board paddling, soft sand running, swimming and road running from Bondi Beach to Cronulla all in honour of the work done at the Hospital. Although the lifeguards had taken on the challenge in previous years this was the first time they got on their boards to support us. We are always thrilled when community groups come up with unique ways to get behind what happens at the Hospital. Vitrectomy surgery is a specialised eye operation in which instruments are placed into the back of the eye so that the vitreous, a clear jelly-like substance, can be removed and the retina accessed. We are fortunate to have a specialist in vitreoretinal surgery on staff at the Hospital. What the team didn’t have was a vitrectomy machine, a specialist piece of equipment to help perform this particular type of surgery. We recently sent the team the funds they urgently needed to invest in this vital piece of equipment. At the Hospital, the Child and Adolescent Mental Health Unit includes a “time out” space or Sensory Room available to all inpatients. 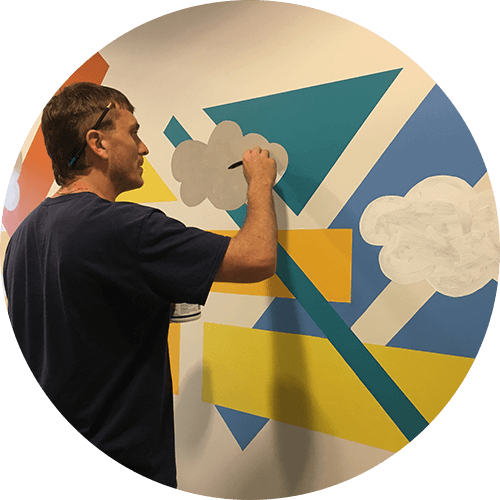 Although the space existed it needed a little love so patients, Hospital staff and the Foundation’s art program teamed up to work together to create a gorgeous mural in this space. Called ‘Abstract Sky’ this simple mural is comprised of layered colour shapes which interpret the changing colours of the sky as time passes from sunrise to sunset. Inpatients were engaged in the whole process from choosing the design to helping paint. Completed in February, the team are excited to see how inpatients use the space over the coming year. It’s always a great way to start the new year with familiar faces, many of whom have been supporting us for years now. Steven Walter Children’s Cancer Foundation is continuing its long support for the Kids Cancer Centre (KCC) with funding support for a three-year project led by Professor Glenn Marshall being conducted in the Steven Walter Laboratory. Also supporting the KCC is Tour de Cure who have made significant commitments to the Centre to purchase some much-needed equipment and fund Dr Richard Mitchell’s research into using parents as donors for stem cell transplants for kids with leukaemia. These stories are just some of the ways the Foundation contributes to the Hospital, all made possible by the generous, ongoing support of our community. 2018 is full of new opportunities for us to make a lasting difference in the lives of sick kids, thank you all for being a part of it.